This weekend, my therapist is at the same conference, at the same place, as she was when I wrote this post. So much has changed in the last couple of years – for one thing, email correspondence is no longer a part of our therapy – but she hasn’t changed. Her love, and her giving, haven’t changed. My appreciation and gratitude for that love and that giving, grow every day. It’s a privilege to know her and to do this work together…. 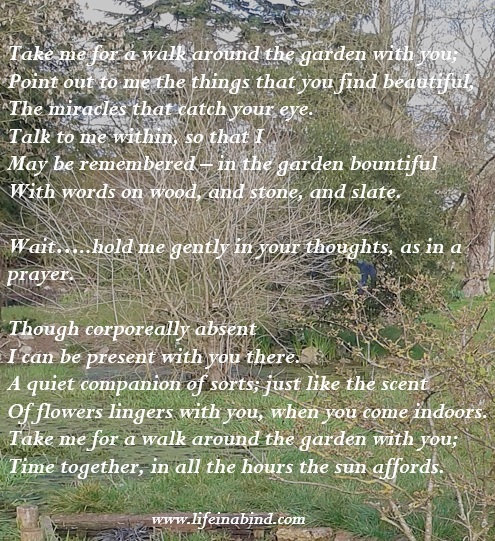 And since I wrote this post, her love of gardens and gardening has led me into this area for myself – a gift of herself and her influence that will last a lifetime, and makes life more beautiful, for all the hours that that life affords. Categories: Poems, quotes and music, Reblogs, Therapy | Tags: borderline personality disorder, BPD, love and therapy, poetry, therapeutic relationship, therapy | Permalink. I made what looked like a very small decision last week, but it felt as though it carried particular significance. A few years ago I was one of a number of runners up in a writing competition, and part of my prize was a book on particular hobby – for the sake of anonymising details of this story, let’s say it was baking! I’m not a baker, and it’s not something I can see myself developing an interest in, in the foreseeable future. However, I am aware that one of my therapist’s daughters is a keen baker, and I thought of her as soon as I saw the book. Over the last few years I have wondered, on and off, about what to do with the book. I’ve tried to think of friends of mine who might appreciate it and only came up with one name. A number of times I was on the verge of mentioning it to that friend, but something always held me back. Every time I saw it on my shelf I would think of my therapist’s daughter, and how much I thought she might like it. Perhaps I simply wanted to hold onto any reminder of my therapist, however oblique, and however uncomfortable (because after all, the book was also a reminder of the family of which I was not a part). Part of me wondered whether one day, in the far distant future, I might actually take up baking myself. I know that that part of myself was the one that wanted to please and thought that the way to do so was to conform to another’s way of being, or a way of being that was admired or approved of. My therapist is also a baker, and I imagined this was a precious link between her and her daughter, something that she would observe in her daughter, and feel moved, or proud. I have an enormous ache for her to feel proud of me, to feel moved by me. On the other hand, the part of me that indulges fantasy still held onto the hope and the desire that I might actually be able to give the book to my therapist to give to her daughter. The logical part of my brain knows how unrealistic that is, and also how strange and uncomfortable that could be, from the point of view of my therapist’s daughter. But my mind was holding onto the idea of a tangible expression of my desire to belong to and be a part of my therapist’s family – a hope and desire that is a perfectly legitimate and interesting subject for discussion in therapy, but one that cannot get played out in reality, because it is at odds with reality. It doesn’t fit with the facts, or with what is possible. Last week I decided to give the book to the daughter of a friend of mine, who though still at primary school, loves to bake and is already impressively proficient at it! Giving it to ‘a daughter’ (albeit not my therapist’s daughter) rather than to a friend, somehow felt like the right thing to do. It made me more conscious of the ‘divided role’ my therapist’s daughters play in my fantasies, as either sisters, or daughters. But more than that, I was aware that giving away the book felt like a significant parting – a parting with a way of thinking and being, as well as a parting with an object. It signified acceptance of reality as it is, and the impossibility of the fantasy I had held on to. It is one thing to know reality, and another thing to attempt to come to terms with it. Giving away the book was a small victory, but it wasn’t completely easy and straightforward, even after all this time and work – there was a tug, a wrench, in giving it away, even though I knew I needed to do it. Giving the book away also signified acceptance of the fact that the reality of my relationship with my therapist does not in any way rest or depend on these oblique and tangible connections, which have little meaning in the context of the relationship, and neither do they add anything to it. The only things that carry weight and create a greater sense of internalisation of the relationship, are the things that transpire in the room or are closely connected with them. That might include tangible objects (for example, the stone my therapist gave me, or perhaps objects I have given to her), but on the whole they live in the interactions, moments, and memories shared, and the ways those become absorbed into oneself. The decision I made last week therefore felt as though it flowed out of the work I was doing in therapy just before Christmas, both in relation to acceptance of the nature of the therapeutic relationship (including its time-limited aspect), and the decision to ask my therapist to destroy my ex-therapist’s notes of our sessions, without me reading them (a decision almost three years in the making, while my therapist acted as the ‘custodian’ of the notes for me). It felt like a small victory, and both a sign of and an outpouring from the larger internal victory that had come before. Though I was not consciously trying to do ‘therapeutic work’ over the Christmas therapy break – and in fact I was trying to take a break from it! – it’s good to know, through small victories such as this, that the work continues anyway, in the subconscious. 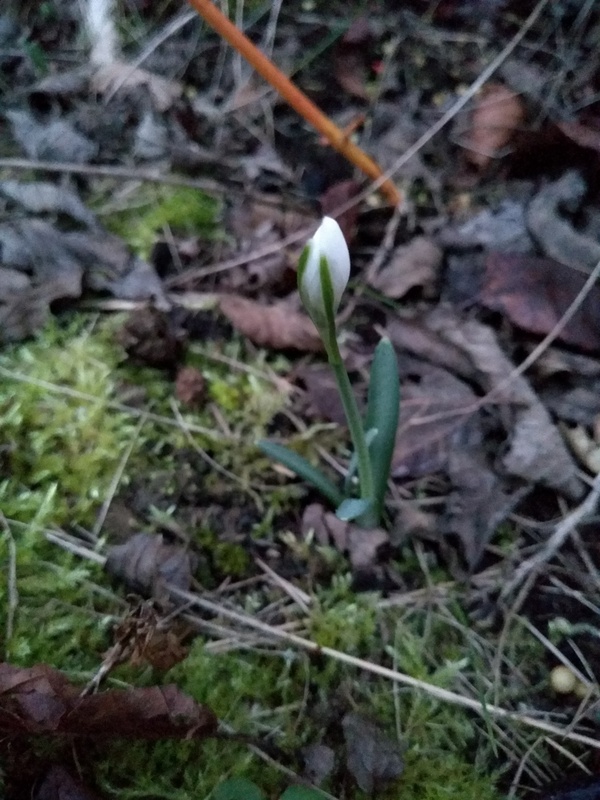 Much as, I imagine, mysterious things were happening underground which led to my first snowdrop appearing in my garden, just a few days after the new year………. Categories: Therapy | Tags: acceptance in therapy, borderline personality disorder, BPD, fantasy in therapy, small victories in therapy, therapeutic relationship, therapy, wanting to be part of therapist's family | Permalink. Almost three years ago, in March 2016, I wrote a series of posts called: ‘This thing that I have done – Part 1’; ‘This thing that I have done – Part 2’; and ‘A twist in the tale of this thing that I have done’. They were about the fact that I had obtained a copy of the notes of my sessions with my ex-therapist Jane, just before the service through which I had seen her, was due to shred them. My therapist and I spent a number of sessions discussing what might lie behind my decision to obtain a copy of the notes, what meaning it might carry, and how I should come to a decision about whether or not to read the notes. Jane and I only saw each other for fifteen sessions, as the counselling service she worked for only offered short term therapy. Though I tried to enter private therapy with her a few months later, she decided to take early retirement for health and family reasons, and the hope of seeing her again, never came to pass. In a number of different ways, therefore, our work together was artificially constrained and cut short, in ways that perhaps neither of us would have chosen, and some of which we could not have foreseen. Obtaining the notes was a way of exercising control over this particular ‘ending’ in a way that I couldn’t over previous endings. It was a way of guarding against the spectre of regret if I didn’t ‘save’ the notes and could never read them, and against the fear that I would lose my memories of Jane and our sessions, in the course of time. The notes held the possibility of gaining a glimpse into her thoughts, and a validation of my struggles. They held the possibility of seeing myself through her eyes, and the hope that she would be the non-distorted mirror that my parents never were. But I also knew that the notes held the possibility of disappointment; of not finding what I was hoping for, or of finding things that would be hard to understand, difficult to accept, and impossible to go back and query or clarify. I knew that they held not just the possibility, but the likelihood that reading them would do more harm than good. Having taken eighteen months to fully grieve losing Jane, and having reached a state of acceptance and being able to treasure and feel nourished by positive memories, it was difficult to see any way in which reading the notes could add, rather than detract, from that. And yet, the draw towards reading them was very strong. So strong, in fact, that I put the notes in an envelope and gave them to my therapist, asking her to keep them safe for me, until such time as I made a decision about whether or not to read them. That session, when I gave her the notes, was a wonderfully connecting hour – I had a desire, which she seemed to share, that reading the notes should be something that, if we did it, we should do together. That the role of the notes was to be worked out within my therapy and in the context of our relationship, and not outside it. My therapist didn’t press the point, but I knew that her view was that I didn’t need to read the notes. That my memories of my relationship with Jane, my experience of my sessions with her, was enough, and would sustain me, and would be there for me to call on internally. Even now, my therapist still points out that I put a great deal of emphasis on the external, rather than being nourished by my ‘internal objects’. It reminds me of a section of a podcast I listened to recently by the wonderful ‘This Jungian Life’, on the subject of ‘Slobs’! In a discussion about hoarding, and the value placed on external objects, the point was made that we have the tendency to want to ‘concretise’, and it can be difficult to let things go and to appreciate that there is a space between an object and the feelings that are connected with it – the feelings do not depend on the object for their existence. Jungian analyst Joseph Lee made the point that sometimes we do not have “a confidence in our psyche’s ability to keep us in relationship to the thoughts and memories that accrete around the objects; so we falsely fear that if the object goes away then my feelings and memories that relate to the object will no longer be accessible to me “. She said of her comment ‘I usually don’t do this [comment at length], but I feel you are at a crossroads in your growth’. She was right – and I think that my positive decision to trust my therapist, to focus on our therapy, and to put aside Jane’s notes at least for a time, was a key turning point and the start of what soon became a period of vital change and insights in my therapy. “Ultimately, radical acceptance of reality as it is, is what’s left when my Resistance fades away”. Two and half years is a long time, but I’m learning that working with the subconscious is a tricky and time-consuming business, and it is not just the conscious parts of my personality that can be stubborn! I need no more evidence of the incredible power of the subconscious, than the fact that the act of sabotage to my therapy that I mentioned, took place just hours after I came to a very important decision – the decision, finally, two and half years later, to ask my therapist to shred Jane’s notes, without me reading them. I realized that I had reached the point where I could trust in my memories of Jane, and what I carried of her, within me. I could trust my internal sense of the relationship I had had with her, and that was enough for me. I had reached the point where I could see clearly that what we experienced together in our sessions, was what was ultimately real, and was what constituted our relationship. What we created between us was the only reality that mattered and that could meaningful for me, and I was finally able to let go of the possibilities (both for good and for ill) that I used to think were contained within the notes. Dimly, at the back of my mind, I was aware that there was an important lesson in there that I could transfer to my current therapeutic relationship. In the back of my mind I knew that this decision had come about not because of anything to do with Jane, but because of progress within my current therapy. In the back of my mind was a realization that the reality and significance of my therapeutic relationship lay in mine and my therapist’s direct experiences of each other, and that I needed nothing outside of this to confirm the reality and significance of that relationship, either now or in the future. But I didn’t consciously reach for that lesson, and I didn’t bring that realization into my awareness. And hours later I found myself, for the first time in eighteen months, engaged in a serious act of internet sleuthing as regards my therapist. A serious act of looking for something outside my direct experience of the relationship, to make it somehow more real, and longer lasting. A last-ditch attempt by my subconscious either to subvert the realization, or, if one were to be charitable to it, to hasten its awareness. Though in the past I have fought my therapist’s emphasis on the powerful agency of my subconscious, this time I had absolutely no doubt of its role in this incident, and in the connection of those two events – my decision to let go of Jane’s notes, and my subversion of the equivalent path with regard to my therapy. I told my therapist I would like to destroy Jane’s notes, that I was ready to let them go. She asked if I wanted to do it, and I said that I was happy for her to shred them. She said they would go on her compost heap along with all her other shredded paper – I think that’s a rather fitting end for them, considering plants and gardens are an important point of connection between us, and my therapist often uses garden related metaphors in our work. I like the idea of Jane’s shredded notes, eventually helping my therapist’s garden to grow! My work with Jane was the starting point and catalyst for my current therapeutic work, and she was also the one who referred me on to my therapist. A number of readers and bloggers said at the time, that they were interested in how the tale of this thing that I had done, would eventually turn out, and that they were contemplating a similar course of action, or were caught in a similar dilemma. If any of them are still reading, I’m sorry it’s taken this long to come to a resolution! But I also hope this resolution is an encouragement – an encouragement to look within and beyond the immediate desire to take a course of action, and an encouragement to wait until you reach your own conviction, however long that may be. And an encouragement I hope, that however scary it may be, to quote ‘Reflections’, “Who we are, and who we are becoming, changes”. Categories: All about Jane, Therapy | Tags: All about Jane, borderline personality disorder, BPD, googling therapist, internalising therapist, keeping therapist real, memory and therapy, radical acceptance in therapy, reading therapist's notes, resistance in therapy, therapeutic relationship, therapy, wanting to remember therapy sessions | Permalink. Peace. For the last few mornings, as I’ve woken up and the first feeling I’ve been aware of is a heavy sadness inside my chest, all I’ve wanted to feel is peace. Not just peace and respite from pain and internal battles, but a sense of being at peace with myself – contentment, calm, safety, a sense of feeling loved and having a place in the world. What some authors, researchers, and therapists (writers such as Brene Brown and Hilary Jacobs Hendel) might call an open-hearted or whole-hearted state, a state of the authentic, vulnerable, Self. What struck me a few mornings ago – when it wasn’t Christmas day and I was still at home and not surrounded by family and therefore still had the capacity to reason – is how different my desires and longings are now, to how they used to be. I remember how, in 2012, I described to a CBT therapist the intense emotional highs of obsessive relationship. She asked if I could think of different, better, feelings, and I looked at her genuinely baffled by how anyone could think there was something better than emotional intensity. Why feel less, when you could feel more? Guiltily, as it somehow felt wrong, I told her it was the best feeling in the world. The next couple of years were horrendous. I was more unwell than I’ve ever been, and though I hated many aspects of the emotional rollercoaster I was on, emotional intensity still felt like a drug that I needed, and sometimes I used self-harm as a way of administering it. In time, I think I came to know that emotional intensity wasn’t ‘the goal’, in the same way that I knew that self-harm was not a healthy coping strategy; but the intellectual knowledge didn’t translate into emotional knowledge, and I hadn’t yet replaced either intensity or self-harm with solid, deep-seated, internalised alternatives. What struck me a few mornings ago was how firmly and how deeply I now know that there is a better feeling than obsessive relationship, a better feeling than emotional intensity in general. How indubitable is the knowledge that calm, quiet, deep respect, love, and regard for a separate other, both in its giving and in its receiving, is far more fulfilling than an ecstatic loss of sense of self and merger with an ideal. Intensity is about height of feeling – about taking a particular emotion and squeezing it into a peak as narrow and as tall as possible and spearing oneself on it, at a dizzying height. Whereas I’ve discovered through therapy, that what I cherish and long for is a depth and breadth of life and emotion, which has more options, more colour, more shades discernible within it, than are available within a blinding point of intense white light. I want a prism, not a magnifying glass. But much more than that, I want to love and be loved in this new way that simply honours, accepts, and enjoys the other. I want to feel the warmth, joy, and security of knowing I love and am loved for who I am – as is the case with my therapist – and that because of that I have the ability to enjoy and take in the world, and experience myself and others, in a different way. And I want to experience much more often the deeply fulfilling contentment and peace that comes with those things. What struck me a few morning ago, was not a new realisation, but one I had started to come to gradually, a couple of years ago, and which over time has settled, and deepened, and gained even greater conviction. What was a new realisation – or at least more recent, from the last couple of months – was the thought that intensity takes me away from who I am. It is one of the very many things – which includes internal resistance, self-sabotage, projection, envy, resentment – which take me further from myself, and which separate me from my true Self. Emotional intensity is not just contrary to the kind of emotional experience I now deeply value, it also separates me from an open-hearted, whole-hearted state in which I am vulnerably, authentically me. And therefore it also prevents me from acting in accordance with who I am, and in a way that honours the people and things I hold dear. There isn’t necessarily anything wrong with strong feeling – strong anger, strong sadness, grief, or joy, for example. There is nothing wrong with a strong, genuine awareness of our authentic self. But what I realised fairly recently is that intense emotion is a state of ‘being caught up’ in something ‘other’, whereas genuine strong emotion comes from deep within our core, and grounds us to ourselves. Strong emotion that comes from within our core, shows us something valuable about ourselves, whereas the first thing that happens when we get caught up in intense emotion, is that we completely lose ourselves. Intense emotion is about disconnection from self; whereas strong feeling, focused activity, or passionate endeavour, can be about immersion in something that aligns with, and connects and gives expression to, who we really are. That seems more obvious now, than it ever has done. And yet I still remember the times when it seemed as though to feel intensely was the same as to feel more truly. But intensity, as I now understand it, has very little to do with truth. Changes. Peace. I’m grateful for them; I yearn to experience more of them. I also can’t help thinking that much much more of this inner peace, contentment, vulnerability and authenticity, could result in much more of the peace that is wished for and talked about at Christmas time. I wish you both kinds, wherever you are in the world right now. Categories: Therapy | Tags: authenticity and vulnerability, borderline personality disorder, BPD, change in therapy, inner peace, intense feeling, therapeutic relationship, therapy, therapy love and acceptance | Permalink. I’m honoured and excited to have had a guest blog published on Rachel Kelly’s website towards the end of November, on the subject of writing, and in particular on how writing poetry has been so significant for my well-being. I’m immensely grateful to Rachel for her support and her kind words, and for her inspiration and motivation to keep going both with self-care and with writing! And I’m grateful for the opportunity she gave me to share this – I hope you enjoy it! Categories: Poems, quotes and music | Tags: borderline personality disorder, BPD, poetry, the transformative power of writing poetry, therapeutic relationship, therapy, writing, writing as self-care, writing poetry as therapy | Permalink.